Anyone who spends much time navigating on water knows that the accuracy of a nautical chart is of the utmost importance. There's no exception when it comes to our 3D nautical wood chart of Puget Sound. An array of nautical and topographic features is highlighted on the chart, which is crafted via laser etching to show water depth and estuary features. Cities, national parks and points of interest are detailed as well. 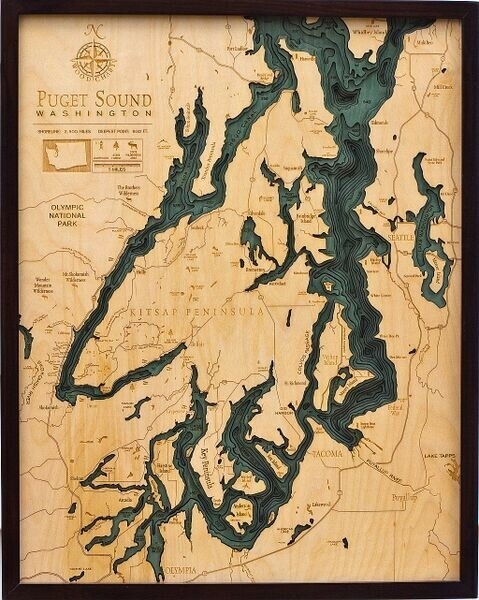 If you're looking for gifts for boaters or for nautical-themed gift ideas for someone who's fallen in love with Puget Sound, there's no better choice than this chart. It's a gorgeous representation of one of the most beloved estuaries in the United States, and it makes a striking impression in any space. Pacific Northwest enthusiasts will love receiving a gift that has the same natural, earthy vibe as the area they love. Of course, our bathymetric chart of the Puget Sound is more than just geographically accurate. It's also a versatile piece of art that can be used in settings ranging from offices to universities to homes. Crafted from Baltic birch and highlighted in a gorgeous aqua wash, it's a nautical chart that's also a standout piece of contemporary art.